Norwegian Cruise Line Holdings Ltd. (NCLH), operator of Norwegian Cruise Line, Oceania Cruises and Regent Seven Seas Cruises, today announced the opening of Ivan Dawson Primary School, the first school to be constructed as a result of the company’s Hope Starts Here hurricane relief campaign. Together with All Hearts and Hands – Smart Response, the company raised over $2.5 million dollars to deliver early relief response and rebuild safe, resilient schools in the Caribbean communities impacted by Hurricanes Irma and Maria. A portion of the proceeds was used to build the primary school on Tortola, British Virgin Islands. On October 5, Norwegian Cruise Line Holdings officials attended the grand opening celebration of the Kindergarten through sixth grade school, which will open its doors to students on October 31. The Hope Starts Here hurricane relief program launched in late September 2017, when the company partnered with relief organization All Hands and Hearts – Smart Response to help provide immediate relief in Key West and reconstruct schools and critical infrastructure in affected islands in the Caribbean including St. Thomas, St. Maarten and Tortola. It has been the largest fundraising campaign in the company’s history. Within 90 days of the launch, Hope Starts Here reached its goal of raising $2.5 million to assist All Hands and Hearts – Smart Response. The program has received more than $1.25 million in donations from the company’s valued team members, loyal guests, travel partners and business partners, which Norwegian Cruise Line Holdings Ltd. has matched. American Cruise Lines’ new riverboat American Song departed from the Port of New Orleans this past Saturday, October 6, 2018. Underway at 100% capacity, this new riverboat is off to a great start and is cruising the Mississippi River on its 8-day inaugural sailing between New Orleans and Memphis. American Song’s 184 guests are enjoying the cruise with stops at Oak Alley, Baton Rouge, St. Francisville, Natchez, and Vicksburg, arriving in Memphis Friday, October 12th. 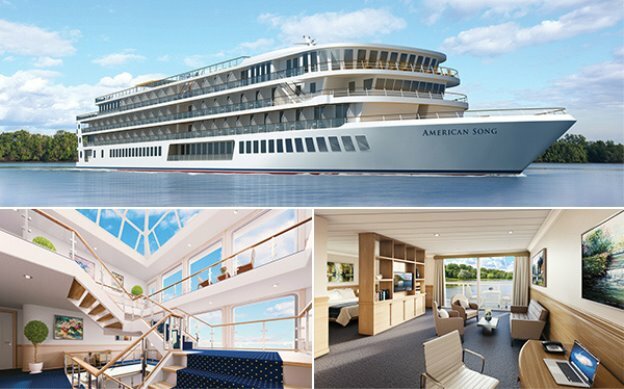 American Song is the first ship in American Cruise Lines’ new modern riverboat series—the 2nd ship in the series, American Harmony, is under construction and will be launched in a few weeks. American Cruise Lines also operates a fleet of classic paddle wheelers. After this week’s inaugural cruise, American Song will continue to cruise the Mississippi throughout 2018. In 2019, American Song will reposition out West to the Columbia & Snake Rivers and American Harmony will begin cruising the Mississippi. American Song is equipped with many modern features, including a unique bow with a retractable gangway. The interior design offers a five-story glass atrium with spacious lounges and sweeping views throughout the ship. The vessel offers the largest staterooms in the riverboat industry, with floor-to-ceiling glass doors, and private furnished balconies. Silversea Cruises and corporate partner Royal Caribbean Cruises Ltd (RCL) today announced agreements to build three new ships for the ultra-luxury and expedition cruise brand that recently joined the RCL family. The inflow of capital from RCL was a key factor in the decision by Silverseas to enter into a partnership. Norwegian Cruise Line today announced an expansion of the free and reduced round trip airfare offer for new reservations on select cruises sailing from November 2018 through September 2019. But you need to act fast because you must book by October 16 to get the offer. The promotion includes free or reduced round trip economy class airfare for up to two guests from over 100 airports across the U.S. and Canada flying to homeports including Honolulu, Los Angeles, Miami, New Orleans, New York, Port Canaveral, San Juan, Seattle and Tampa. Guests reserving an oceanview, balcony and mini-suite stateroom receive free or discounted airfare from select gateways. The Haven and Concierge level receive complimentary airfare at all eligible airports. The Free Air promotion is also combinable with Norwegian’s Unlimited Internet Package, and Norwegian’s Free at Sea offer, which allows guests to select up to five specified amenities of their choosing. Available on 12 of Norwegian’s ships, including Norwegian’s newest sister ships Norwegian Joy and Norwegian Bliss, the promotion applies to select sailings including Alaska, Bahamas and Florida; Bermuda; the Caribbean; Canada and New England; Hawaii; Mexican Riviera; and the Panama Canal. The limited-time Free Air offer is also available for new reservations on Pride of America, the only ship to offer seven-day inter-island Hawaii cruises from Honolulu. The promotion is available in all stateroom categories, excluding Sail Away categories and must be combined with a one-night pre-cruise hotel stay. Carnival Cruise Line carries more military personnel and their families than any other cruise operator and is steadfast in their support of the troops and their families. As a military veteran myself, this means a great deal to me personally. To recognize this, the company has been presented with the prestigious U.S. Honor Flag bestowed by the Miami-Dade Police Department Honor Guard.